In the style of the Epyx "Games" series, players can compete in five different skateboarding events, either individually or sequentially. When the events are challenged sequentially, up to eight players could sign up to participate. The original Commodore 64 version was created by Michael Kosaka, Stephen Landrum and David Bunch. This group of programmers had previously been at Epyx and worked on the early "Games" titles. The game featured two ramp events - the freestyle ramp and the high jump, two downhill events - the downhill race (in a park setting) and the downhill jam (in a street setting), and the pool joust. The pool joust, downhill jam, and the downhill race (in two player mode only) were all head to head, while the ramp events were single player. Except for the joust, which was a hand-to-hand knockout competition (literally and figuratively), all of the event winners were decided by a point system. 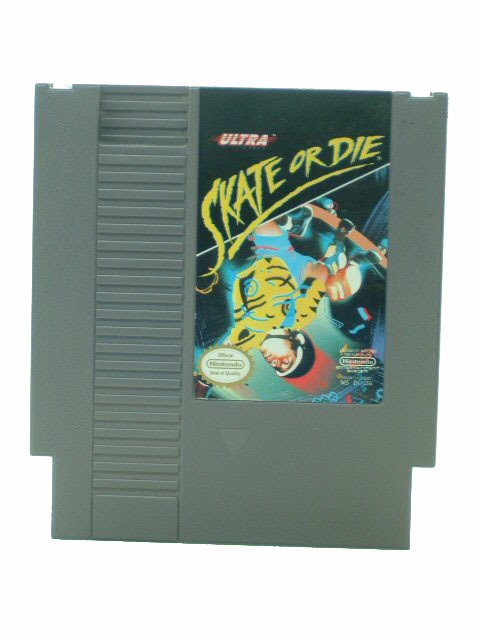 Title screenshot to Skate or Die for the NES. Two characters were featured in Skate or Die! : Rodney Recloose, a wild man with a purple mohawk and a Marine Corps tattoo (and a facial resemblance to comedian Rodney Dangerfield) who runs a skateshop in the game, and his son Bionic Lester, an even wilder kid with a green flattop, who you were able to take on in the joust and the downhill jam. In the joust, Lester and his two cronies await the skater. Poseur Pete challenges beginners and Aggro Eddie takes on intermediate players, leaving Lester with the advanced pros.